I love Mario sports games, and after Camelot's excellent Mario Golf: World Tour on the Nintendo 3DS, I was quite hyped to see their first HD Mario sports title. Unfortunately, the game, Mario Tennis: Ultra Smash, lacks a lot of what I want out of the series... or any tennis game for $50 for that matter. 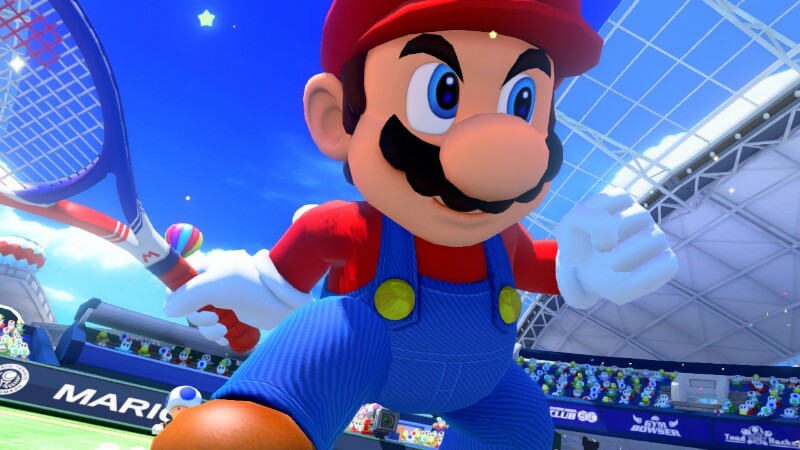 The Wii U's 2015 holiday season has been rocky at best. The early delay of the new Legend of Zelda game for Wii U into next year really took the sails out of the system, but the extra punch to the system's gut was the delay of Star Fox Zero. That game was supposed to release this past November. Instead, Nintendo was caught in precarious position, not having a big title for their typically huge November. What came to replace Star Fox Zero in the usually big November holiday shopping date was Mario Tennis: Ultra Smash. While the gameplay is still as excellent as ever, it is quite apparent that the game was rushed to market to fill in the gap that Zelda and Star Fox Zero left behind. the tennis court isn't the most epic to be found. As the tagline of this review would lead you to believe, Mario Tennis: Ultra Smash is definitely hurting for modes. 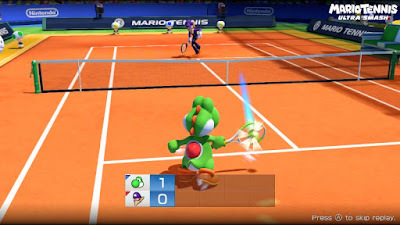 The typical, traditional, and quite frankly, expected modes from past Mario Tennis games are nowhere to be found. There aren't mini-games like Ring Shot, and there is not even a Tournament Mode, a mainstay for the series. Instead, what players get is one mode for solo players in the form Knockout Challenge. This mode pits you and an optional AI-controlled partner (the latter requires an amiibo) against a host of computer opponents. As you beat each opponent, the difficulty slowly but steadily ramps up. By using an amiibo, you can save data to it, improving your AI-controlled partner's stats after every five matches played. Beating 15 opponents in a row unlocks a more powerful version of the character you're currently playing as. Meanwhile, beating 30 opponents unlocks the credits, essentially the means to "beat" the game. Doubles action with Mega Mushrooms is one crazy party. 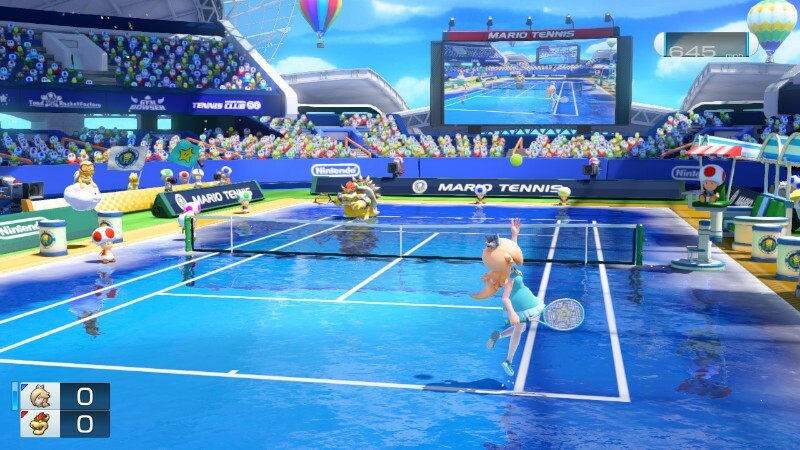 Other modes include a party mode that features singles or doubles play, having the Toads on the sideline throw Mega Mushrooms onto the court. Touching one of these transforms your character into a mega-sized version, able to move around the court more easily and produce immensely powerful shots. There is also a Mega Ball Rally mode, which has you and an AI opponent trying to keep a giant ball in play for as many volleys as possible. Getting 100 volleys in a single game unlocks a secret character. Once this is done, there really is no reason to return to this mode unless you're a huge fan of rallies. he nabs a Mega Mushroom to grow in size and stature. 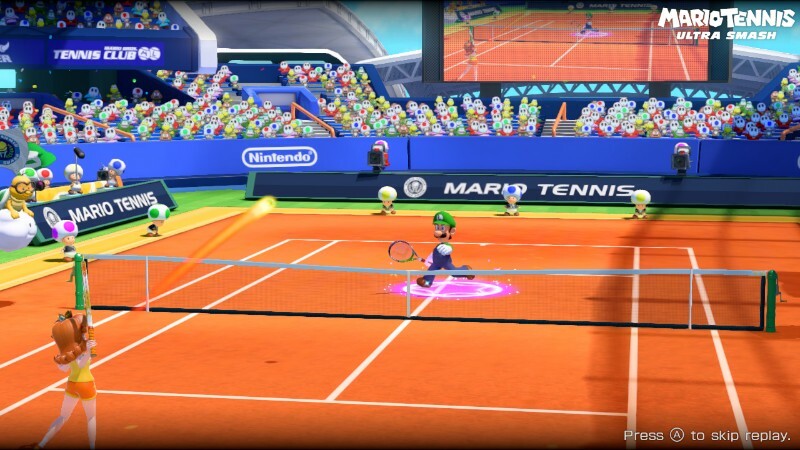 Speaking of secret characters, there are four to unlock within Mario Tennis: Ultra Smash, and the means to do this are relatively simple, usually just playing a certain amount of matches in a given mode. This makes for a final roster count of 16 Mushroom Kingdom characters to play as. Ultra Smash houses 25 unique rewards to unlock as well as a way to add some kind of longevity to the game. These rewards are unlocked by either completing certain in-game tasks like playing a specific amount of matches, beating a set amount of opponents in the Knockout Challenge mode, or getting an amiibo AI opponent's stats to their fullest. Alternately, you can just spend coins earned through regular play to quickly unlock rewards. This is the better option as playing and winning 15 matches as every character in the game in Knockout Challenge would be incredibly tedious to do. Thus, paying the requisite 3,000 coins to unlock the more powerful Star character versions of each character is the smart thing to do. I ended up unlocking all of the 25 rewards in less than six hours time. If you factor in the price of the game, that's about ten dollars for every hour of play time. 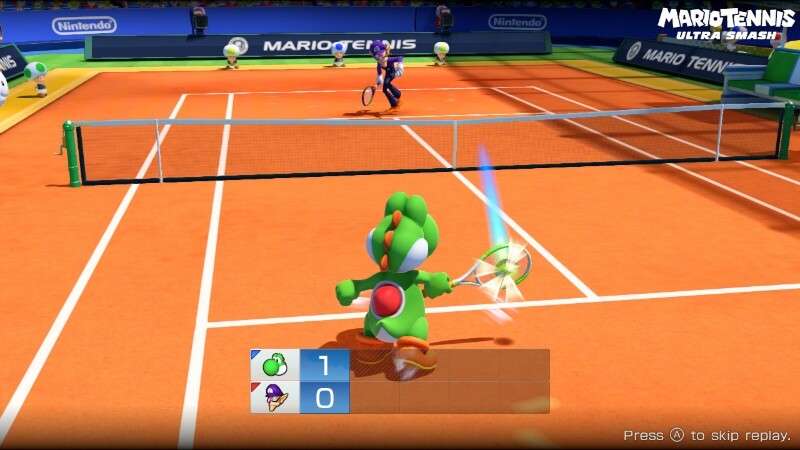 And with this well placed shot, Yoshi went up one set to Waluigi's zero. It's not just the modes that are light in Mario Tennis: Ultra Smash. There is honestly only one stadium within the game. The only thing that changes is the court type. This is astonishing to me and really pushes the idea that the game was rushed to the market. 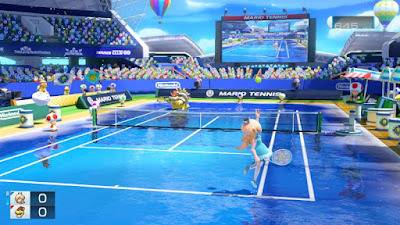 Part of the fun of past Mario Tennis games is having a deluge of different areas and courts to play on, whether it's a court in the clouds, a court within Donkey Kong's jungle, or a court in sunny Ricco Harbor like Mario Power Tennis. Having the same stadium for every match gets rather tiring on the eyes. 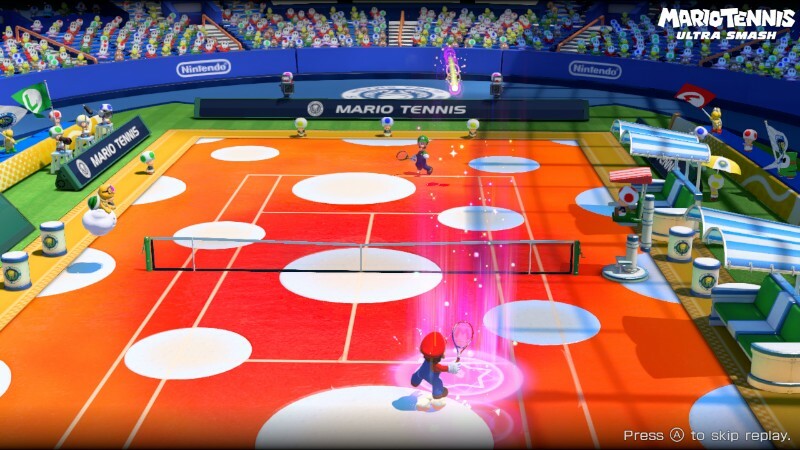 That said, the nine different court types available in Mario Tennis: Ultra Smash (most needing to be unlocked through playing a certain number of matches) do lend themselves to some variety in the tennis action. The carpet court has the fastest ball speeds, while the sand court doesn't lend well to the ball bouncing. Meanwhile, the ice court will have you slipping and sliding around, while the mushroom court contains material that makes the ball bounce its highest. While the variety of court types is nice, it doesn't make the lack of any additional eye candy in different stadiums hurt any less. 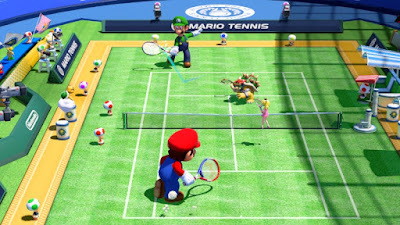 Luigi and Daisy spend time dueling on the tennis court. Furthermore, while there is online play for up to two local friends to hop online and compete against players, there is no option to play against other friends on your Wii U's friends list. 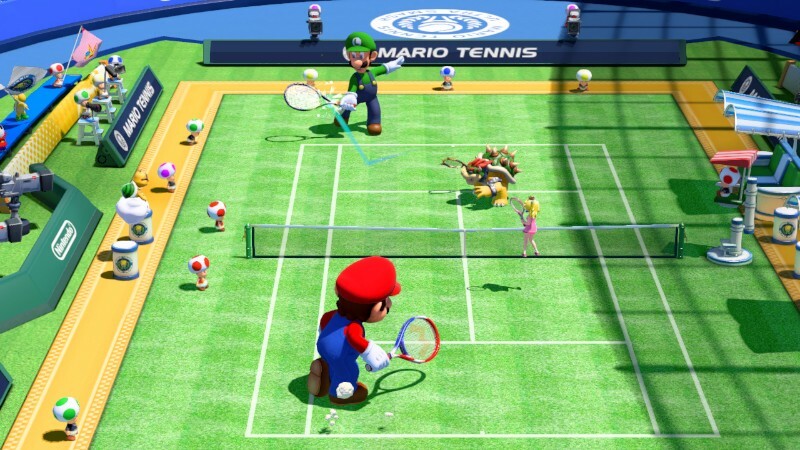 It's a baffling exclusion not being able to even form lobbies or communities like other Nintendo online offerings, and it just increases the idea that the bare minimum was given to this installment of Mario Tennis. 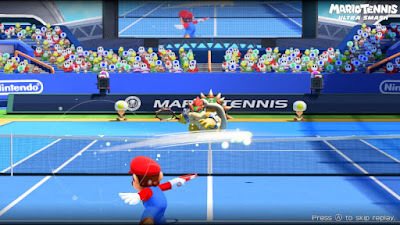 It is an amazing shame that Mario Tennis: Ultra Smash is so lacking in modes, courts, and content because the tennis action is some of the best the series has ever seen. 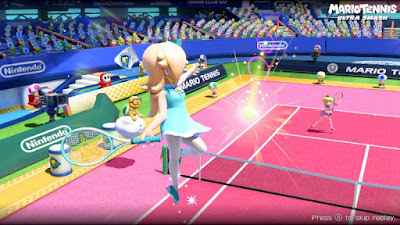 The gameplay is tremendously fun, offering two types of standard tennis play, one with Mario Tennis Open's chance shots, and one that is a more traditional tennis experience like the original Nintendo 64 Mario Tennis. It's a girls' day out on the tennis court today. Chance shots from Mario Tennis Open behave like a Simon Says-like tennis offering, having differently colored markers on the court showing where the ball is going to land on your side of the court. Depending on the color, you are supposed to use a different kind of shot. For instance, a blue circle indicates the need to press the B button, while a yellow circle shows that you should hit the A button and then the B button to unleash a killer lob shot. It's not as simple as hitting the type of shot the game recommends. You can utilize strategy to confuse your opponent, hitting a different type of shot than what the colored circle dictates. This is a perfect strategy to catch your opponent off guard and potentially score some points. Get to the glowing spot to unleash a massive Ultra Smash! When a massive glowing purple circle appears on the court, usually after your opponent has to lunge for the ball in order to hit it, it's your opportunity to make a mad dash for that circle, jump up and perform the game's eponymous Ultra Smash move. This is a high powered offensive smash that blows past your opponent with an immense amount of speed. It's hard to counter such a smash shot, but it is indeed possible. The Ultra Smash feels extraordinarily good to blast down the throat of your opponent-- figuratively speaking, of course. The game is rated "E" for "Everyone", after all. throat with this Ultra Smash... again, figuratively speaking. Thankfully, if chance shots aren't your bag (and it wasn't for many, as that was a big complaint regarding Mario Tennis Open), traditional tennis is available. This offers multiple types of shots, engaging and exciting rallies, more strategy, and a more typical type of tennis. 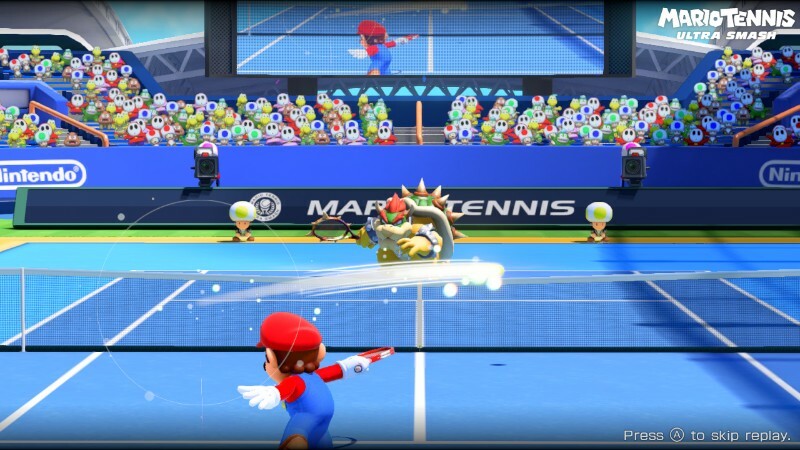 Sure, it may not have all the frills of other modes, but it distills the Mario Tennis gameplay to a fine, well-tuned experience. Mario Tennis: Ultra Smash boasts an absolutely astonishing visual style to it. The game looks bright, colorful, detailed, and gorgeous to the eyes. Characters are animated well, showing off plenty of character in their taunts, how they hit the ball, victory poses, and other animations. Courts also look great, offering effects like footprints in the sand court, beautiful reflections on the ice court, and plenty of other novel visual tricks. The menus are pretty basic, particularly the main menu. The lack of any kind of opening for the game also disappoints. Meanwhile, the music is typical Motoi Sakuraba at his most cruise control, but there are catchy themes to be heard. Bowser and Rosalina slip and slide away on the ice court. 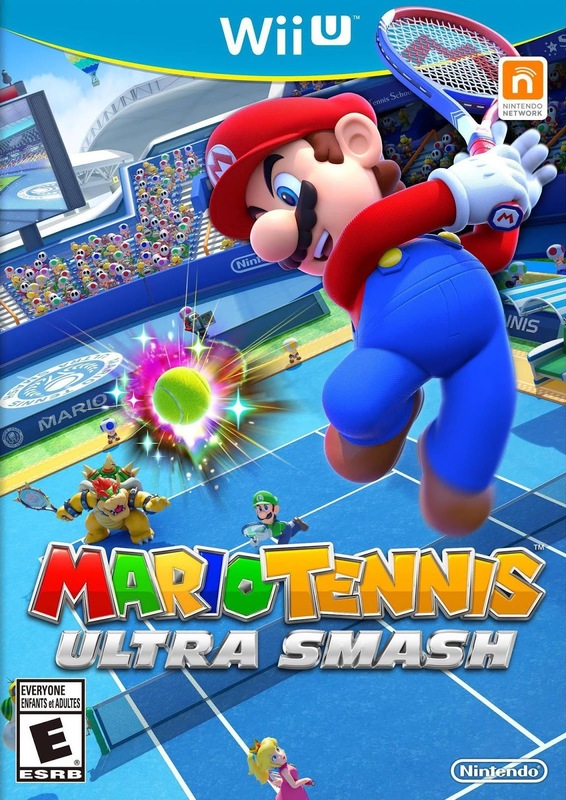 While the actual tennis of Mario Tennis: Ultra Smash is excellent, the rest of the package falls short due to its incredible lack of content. 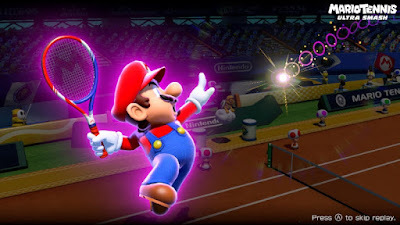 Unless you have the desire to play against random opponents online in the most basic, vanilla online structure imaginable, or have local multiplayer experiences in mind, Mario Tennis: Ultra Smash is not worth the current MSRP of fifty bucks. While not an absolute disaster of a game, the obviousness of how rushed the game was to be released should turn most players off. Currently as it stands, Mario Tennis: Ultra Smash delivers a weak serve and an even weaker amount of content.